Figuring out where to eat could be a daunting task of your day-out. It happened to us last Monday when we had a celebration. A day before, I made reservations at a European restaurant for eight people. I've been interested to try this out since everyone are raving about their food. This restaurant has several branches and I thought their place in Greenbelt is similar to Alabang Town branch. But sad to say, the place is way too small. When hb and I got there, we thought in a flash to look for another venue and informed everyone by texting them. We popped in to several restaurants from Dad's (food was scarce since it was already 1:00 pm), to Hard Rock Cafe (buffet is only offered on Sundays and the "a la carte" are mostly burger and sandwiches), and to Italianni's (place was jam-packed and we had to wait 30 minutes to be able to have a seat). Anyway, to cut a long story short, we had our late lunch at T.G.I. 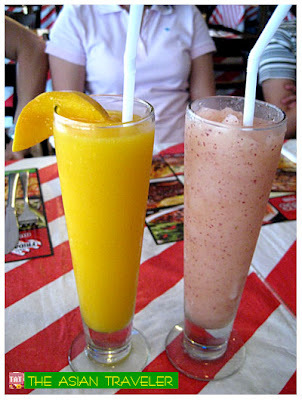 Fridays in Glorietta 3. As everyone probably knows, this is an American restaurant chain concentrating on casual dining. We have been to T.G.I. Friday's a number of times and the food is always pretty good. In my observation, this restaurant does seem to cater to the local patrons but the full bar counter appeals mostly to foreigners. 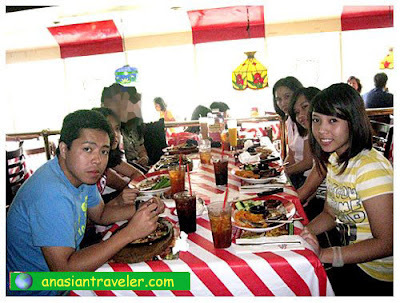 The restaurant has a cheerful and fun atmosphere. It is quite large with eclectic mix of antiques and memorabilia, and also equipped with wall-mounted television sets. The red and white stripe tablecloths are just some of their signature decors. The waiters and waitresses in their black diner uniforms with wacky hats were well-rounded and gave us a thoughtful service. Foods here are a bit expensive but they are incredibly filling. 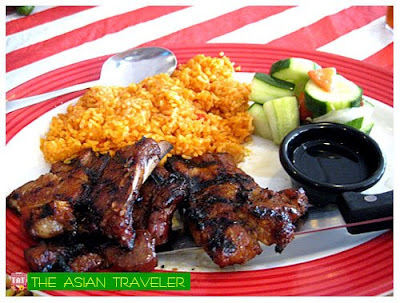 The prices of the main entrees ranged from Php 300 to Php 1,000+. We are always overwhelmed by the selection of dishes - from appetizers, to Jack Daniels Grill, steak house select, pasta and salads, chicken and seafood, along with burger and sandwiches, desserts, lunch, ultimates and mojitos, and wines. My two friends and I ordered a Baby Back Ribs Half slab (Php 590.00 / order), a full rack of pork with full-off-the-bone-tender glazed with barbecue sauce and served with fries (I forgot to take photos). 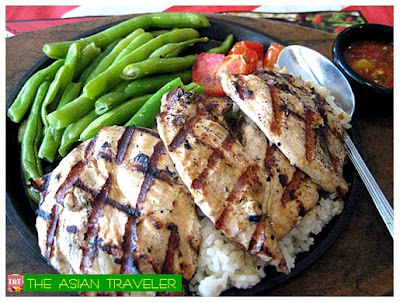 HB, had a Chili Chicken Breast (Php 395.00). 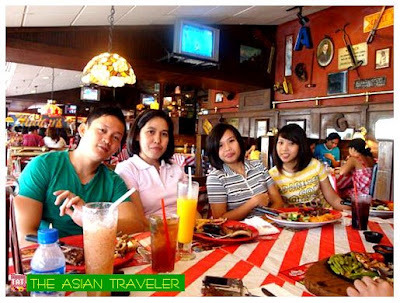 The rest of the family ordered Sizzling Chz Shrimp (Php 595.00), Jack Daniel's Chicken and Shrimp (Php 480.00), juicy fire-grilled chicken breast drizzled with Jack Daniel's sauce and some cajun-spiced fried shrimp with more sauce for dipping. Served with cheddar cheese mashed potatoes and vegetable. Filipino Pork Liempo (Php 395.00), three pieces of pork belly marinated in garlic and sweet soy sauce, grilled and served with Java rice, native ensalada with their own vinegar and garlic sauce. Although the service was a bit slow, our orders were all served at the same time. We had devoured the food in a very short time as we were starving already. The pop music that plays in the background sets the mood for a relaxing lunch and great conversation with family and friends. All in all, our experience was wonderful. With good quality food and beverage and relaxing music, we still look forward to our next dining experience at T.G.I. Friday's. I never been to T.G.I Friday's before. I think there is such outlet in Kuala Lumpur. i too like their food. one order of almost anything will make you full. nice place to dine and enjoy. 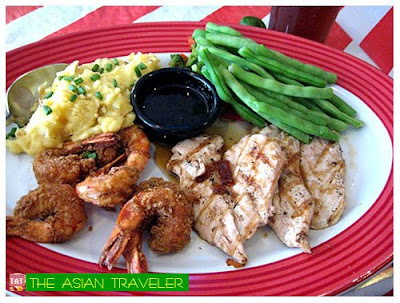 You're right, TGI Friday's in KL, Malaysia serves only beef, chicken and fish for their meals. Pork is not included on the menu. You are a foodie!! Hmm I have not tried TGIF before cos whenever I was deciding whether to go there, someone surely tells me it's an expensive restaurant hehe. If it's nice, I don't mind trying the food one day. I guess the ambience should be quite good right? Sis, I have never been to your country Philippines before. 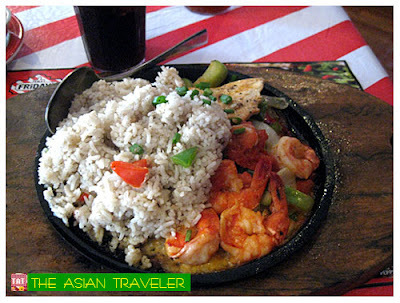 Do you have a short article about a beautiful place in the Philippines which you can contribute to my travel blog? 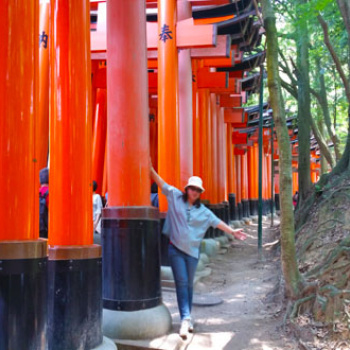 I will feature you as the author and linking it back to your blog! Do email me if you like the idea ok! Thanks! If am not flawed there is branch located in ABS-CBN QC and when I will return the country I wish to visit. Thanks sis. I would love to contribute and share one of the nice places here in the Philippines. But I’m just a little bit occupied now with so many things especially Christmas is fast approaching. Plus we are getting ready to go on a long vacation this holiday.